As technology in higher education rapidly changes, new pedagogical tools are being tested, developed, and implemented. 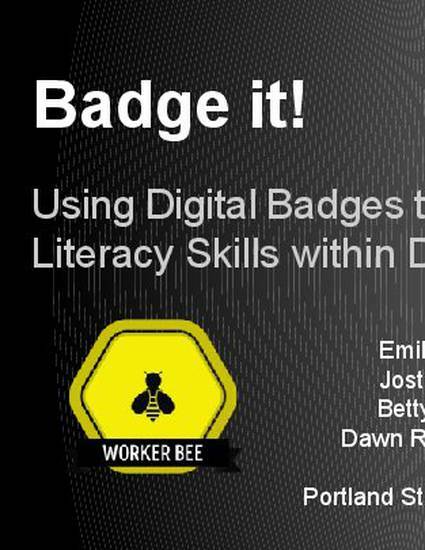 Digital badges systems are one such tool that can be used to certify student skills and competencies, including information literacy skills. Despite new teaching technologies and pedagogical approaches, it remains difficult for instruction librarians to lead experimentation. As a result, librarians depend on collaborative relationships with disciplinary faculty to experiment with pedagogies and tools like badging. At Portland State University, however, librarians are leading a collaborative digital badges project with Community Health Faculty to develop, deliver, assess, and track student achievements in information literacy. In this session Library and Community Health faculty presenters will discuss the ins-and-outs of integrating digital badges into course curriculum to certify information literacy and other achievements. The article associated with this presentation may be accessed at http://archives.pdx.edu/ds/psu/14515.